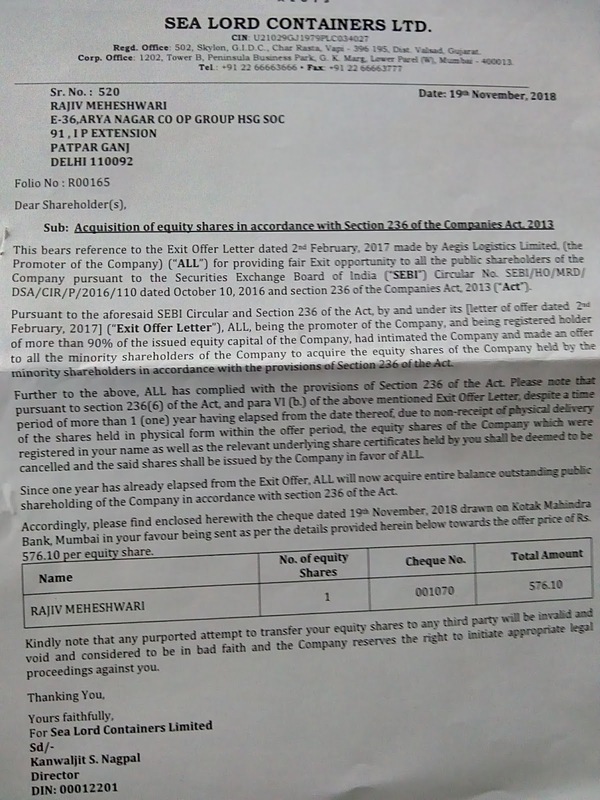 Sea Lord Containers Ltd., which was listed on BSE, came out with an exit offer, as per SEBI guidelines, vide exit offer letter dt. 02-02-2017 and now after expiry of offer period, they have arbitrarily sent, without tendering shares and without the explicit consent of minority shareholders, cheque for the consideration @ Rs. 576.10 per share. They do not have any court order for capital reduction of minority shareholders. Can any body guide us whether company's action is correct or not and what should minority shareholders do ? Please note that exit offer was made by Aegis Logistics Ltd, (The promoter of the company) and cheque for the cancellation amount is issued by the company itself. Absolutely Wrong. Don't Deposit your cheque into bank and encash it. What if court will pass order for compulsory tender of share? what if i dont tender after court order then still i will be able to hold shares?? Please comment if anybody holding shares. What next if i will not tender the shares. ?